Oops, I did it again! 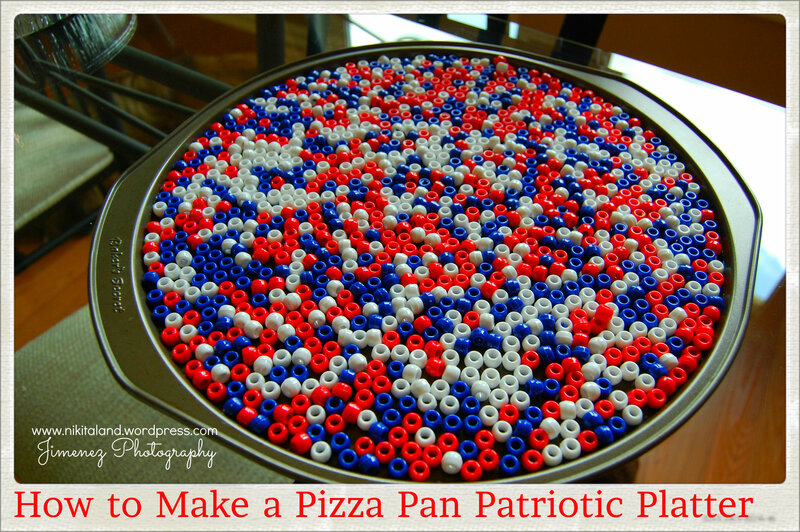 I pulled out my Pony Beads today and created a Pizza Pan Patriotic Platter. With the Fourth of July coming up, I decided that I needed a platter to show off my goodies, like my Patriotic Strawberries, or perhaps some garnishes. 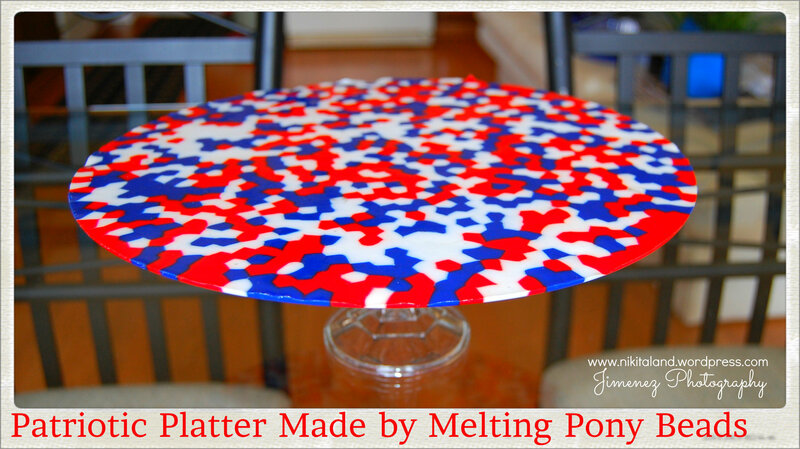 Just like my other Pony Bead projects, I just poured the beads onto the pizza pan and used red, white and blue beads, just perfect for the Fourth of July. Make sure you fill up all the holes on the pan and all of the edges have a bead touching it. 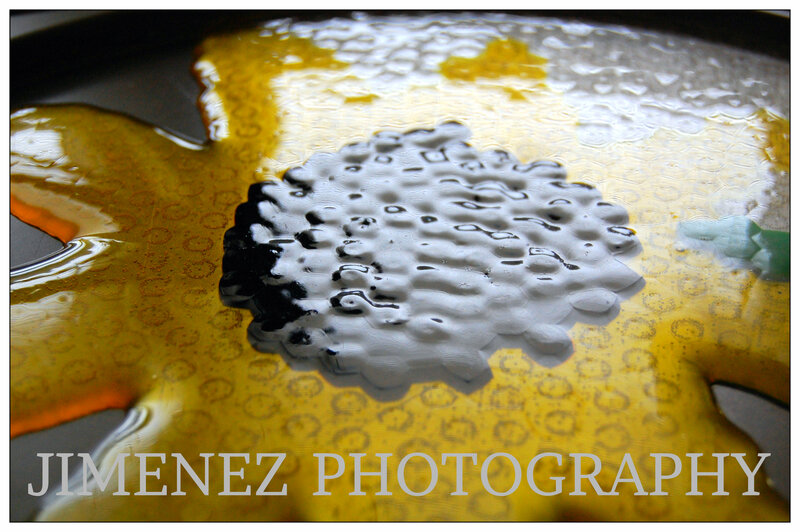 You will start to see the beads starting to melt in the pan. The way you can tell that your project is completely melted, is when the top is completely flat and smooth. 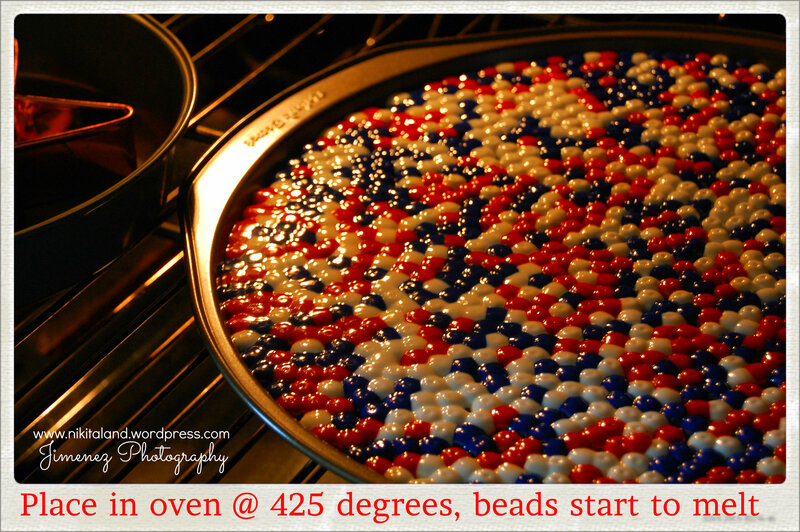 If you still see some bead “bumps”, then it needs to stay in the oven a little longer. 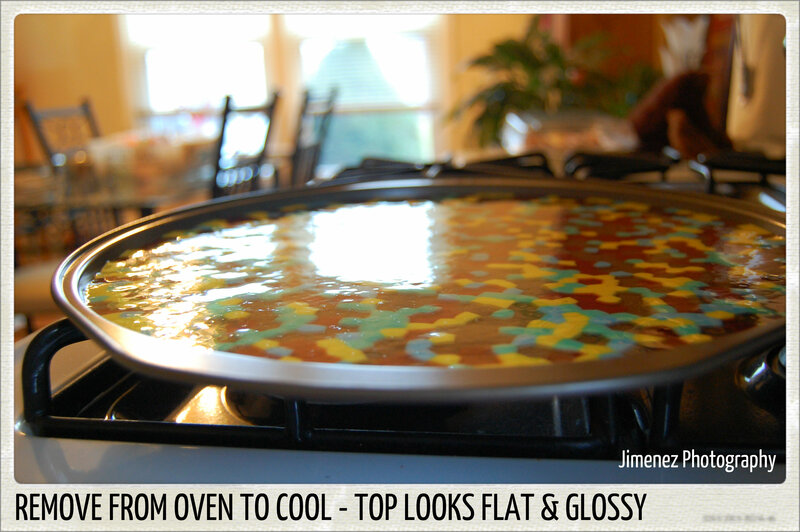 Carefully remove from the oven once the top is completely flat & smooth. Place gently on top of stove to cool. You might hear a slight cracking sound, but that is just the plastic cooling, so do not worry. Once the pan is completely cooled, just turn the pizza pan upside down and the platter will pop out. Easy, right? 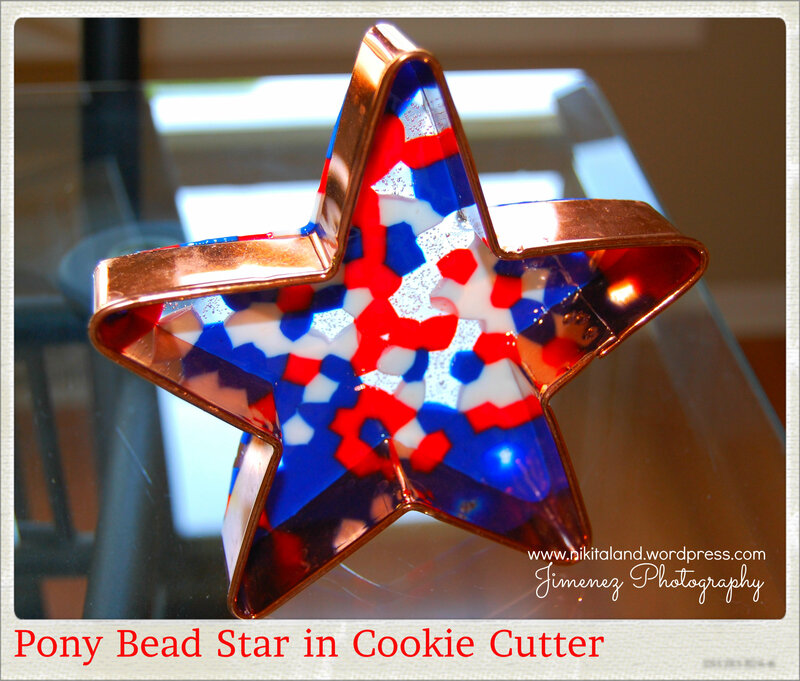 Since I had some red, white and blue Pony Beads left over, I decided to make a Patriotic Star out of a metal cookie cutter. I just placed the metal cookie cutter in a round cake pan, filled the metal star up with Pony Beads and melted it in the oven. 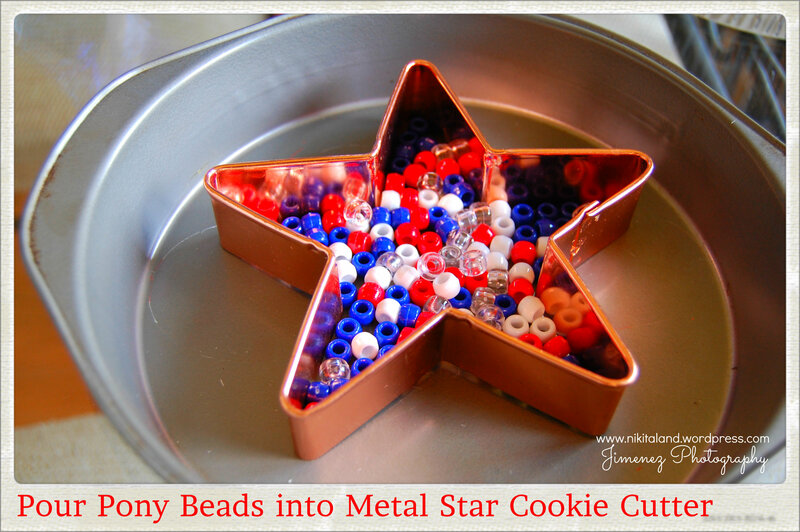 Once it has cooled, just slightly pull on the sides of the metal cookie cutter to release the star and it will pop right out. 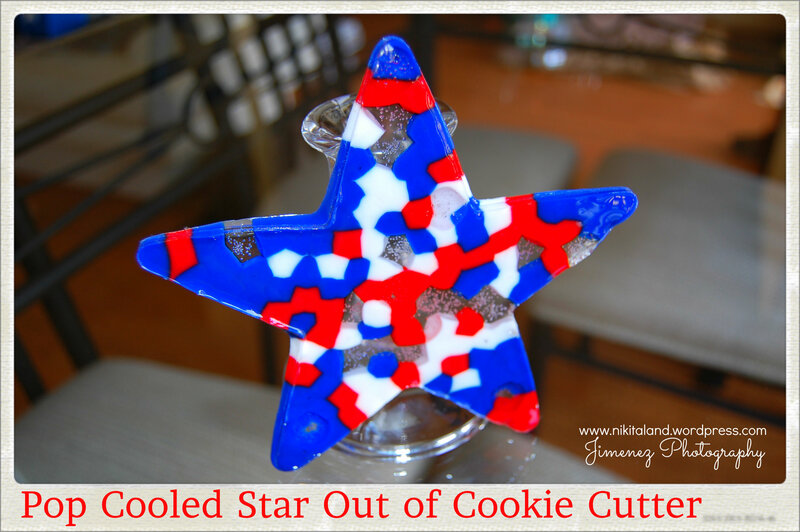 I will probably drill a small hole in the top of this star and hang in my kitchen window for a little Patriotic charm! 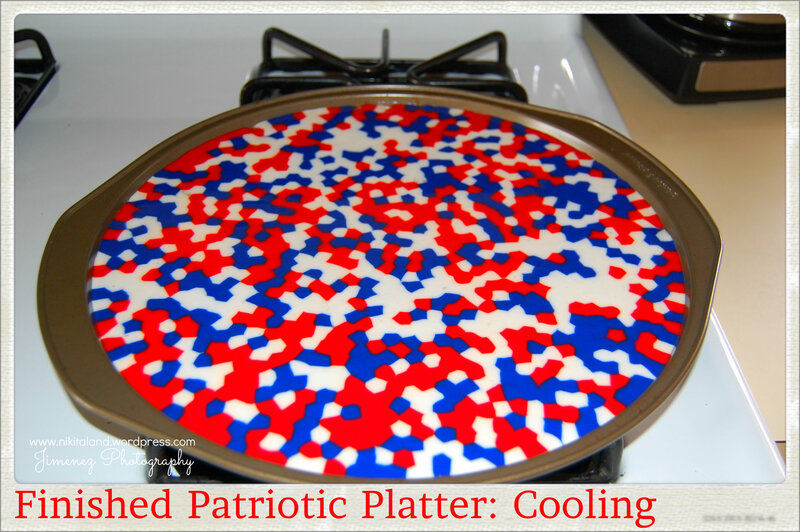 So there you have it, a Pizza Pan Patriotic Platter and a Patriotic Star all made within a few minutes of an afternoon! What a great craft project to share with your kids, or make one for yourself! Just when I thought that this week could not get any better than what it was, it happened. 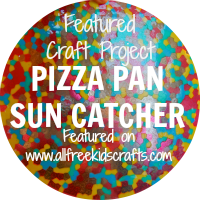 The Editor of All Free Kids Crafts contacted me and wanted to feature my Melted Pony Beads Pizza Pan Sun Catcher on their website! I was tickled pink that she contacted me and this news just made my day. Thanks Jaclyn! I never knew that a pizza pan could make me popular, but it did! I love crafting and seeing what I can come up with next. It’s the thrill that you get when you try something new and it works. 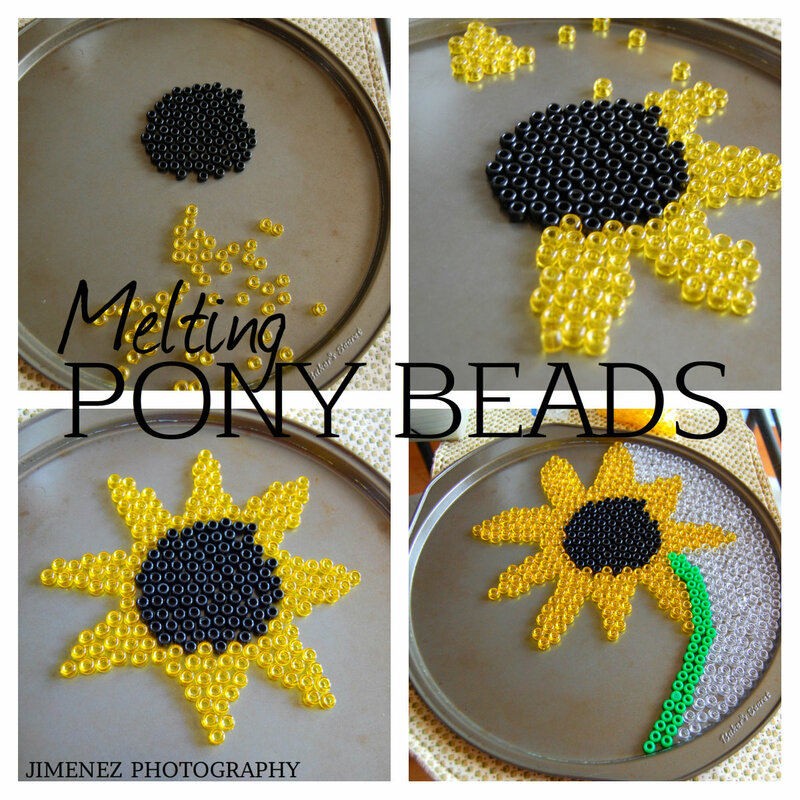 This particular pony bead craft is extremely easy to do! 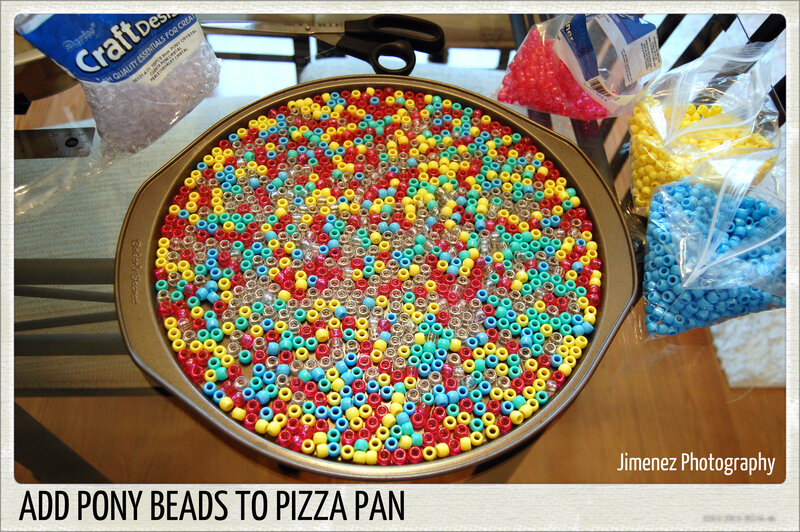 Just grab your pony beads and pour them out onto a pizza pan. Make sure that there are no holes, just add more beads. 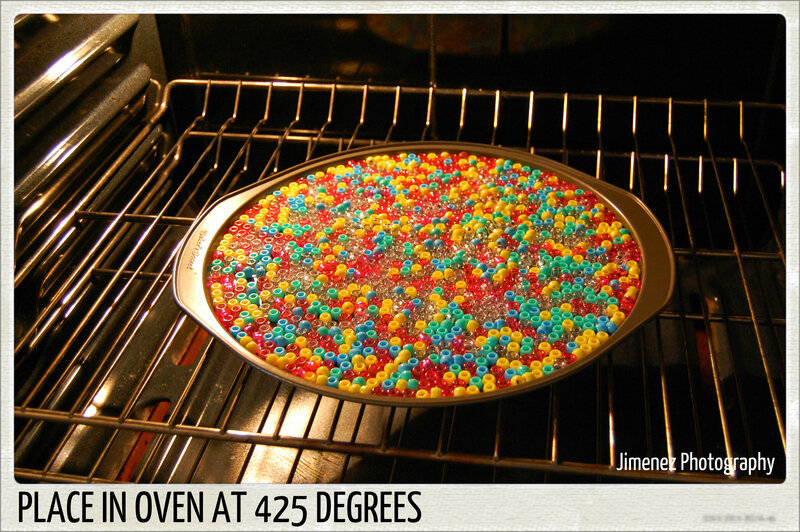 Pop your pizza pan into the oven at 425 degrees for a few minutes (watch through the oven door to see them melt) and when all the beads are melted, and the top appears to be smooth, it’s time to remove them from the oven. Now, just let your pizza pan cool on top of the stove. You will hear some cracking noises, but that is just the plastic cooling. Once cooled, just turn the pizza pan upside down and the round disk will pop right out! Then, if you are going to hang this up as a sun catcher, just drill a small hole at the top for a string. Also, I made a cupcake stand too, just by purchasing a $1 glass candlestick holder from the Dollar Store and gluing it to the bottom of the plastic pizza pan sun catcher! I just never knew that a pizza pan could make me popular! Oops, I did it again! I keep looking at all of the things that I have made by melting Pony Beads and I wondered if they could be melted without a form around them. Hmmmm….interesting thought, so I had to get to work to see what would happen without a cookie cutter form around them. I pulled out the old pizza pan that I have been using and started to design. Since Spring is supposed to be around the corner, I am dreaming of gardening and this year we are going to plant a new kind of sunflowers in our garden for color. 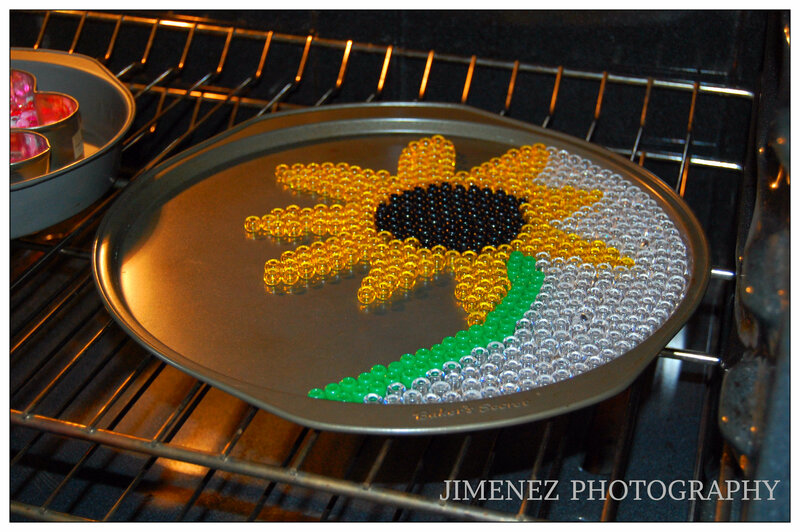 (man I can’t wait) With that thought on my mind, I started to create a sunflower out of Pony Beads on the pizza pan. I started out with a black center of beads and then formed yellow sunflower leaves around the middle. 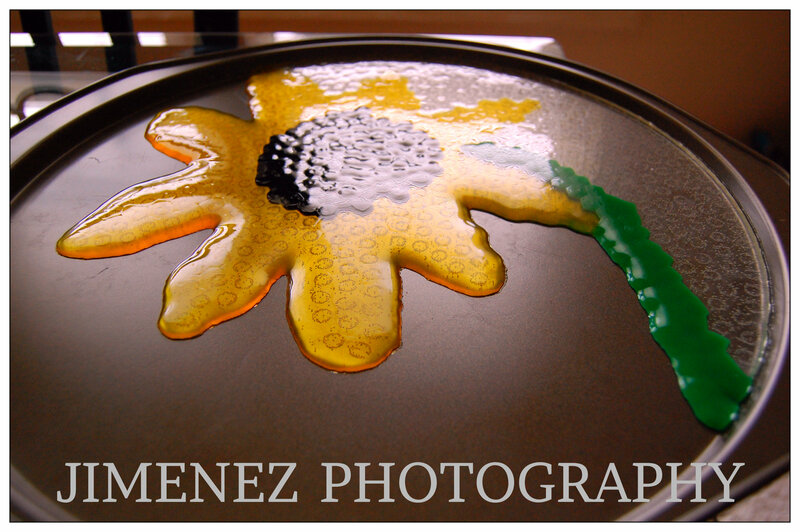 Then I added a green stem and only added clear beads around the right side of the sunflower for filler. Since I wanted to see what happens if you melt Pony Beads without a form, my experiment turned out quite well and the Pony Beads melted perfectly and the sunflower leaves on the left side of the pizza pan turned out just like leaves! Yippee! 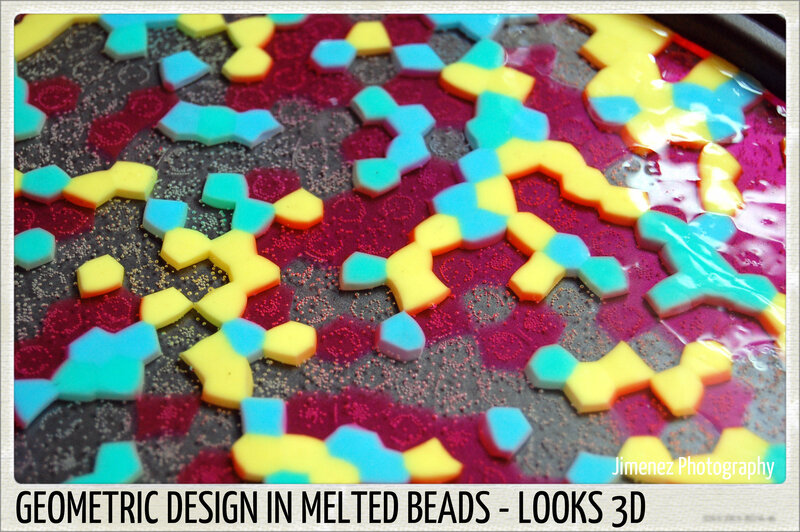 So this tells me that if you want to create a free form kind of art with melting Pony Beads, you can! Design away! If you don’t have any Pony Beads, head out to the store this weekend and pick up a nice big bag and get crafting! This truly is a fun craft to do and the more creative you are, the more interesting your items will turn out! I just can’t seem to leave these pony beads alone lately! 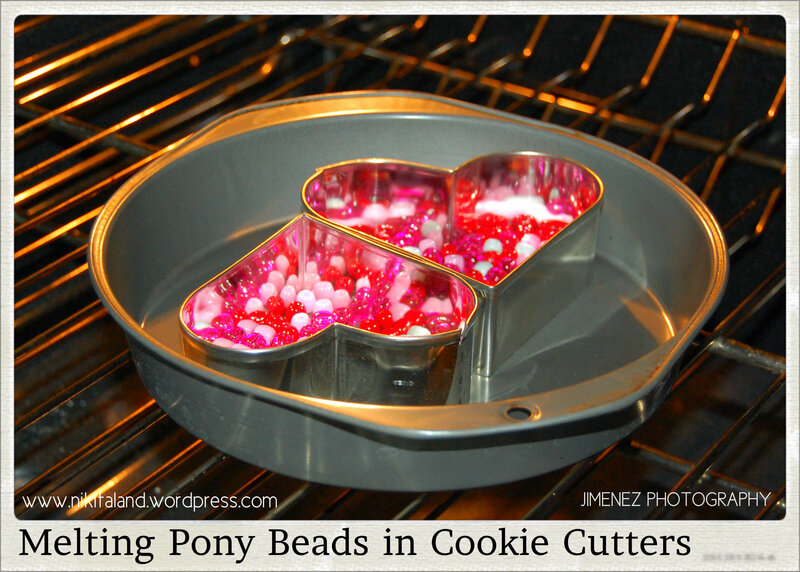 Since I have had great luck with making my sun catchers and future wind chimes from melting pony beads, I had a thought today and wanted to see if I could melt the beads in a cake pan – – – inside a heart cookie cutter. 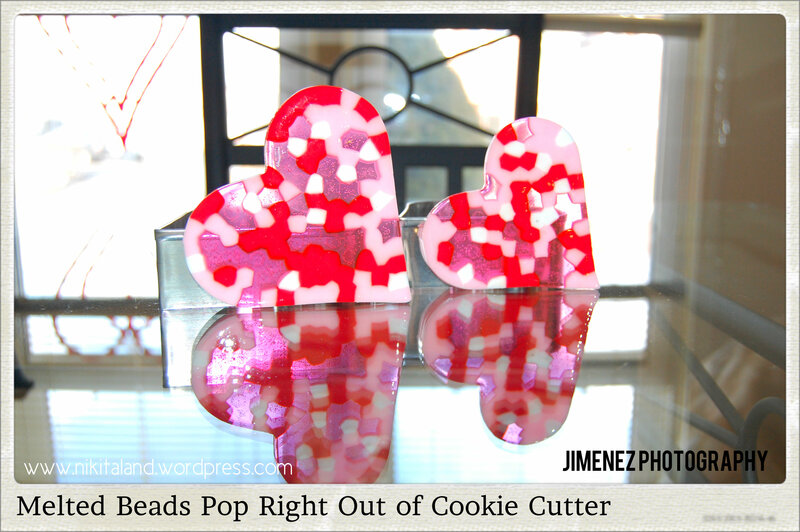 I know, if this experiment failed, then I would have to throw out my two heart shaped cookie cutters, but I was feeling lucky and tried it anyways. I placed two different sized metal heart shaped cookie cutters inside an old cake pan, then filled both hearts with different colored pony beads. 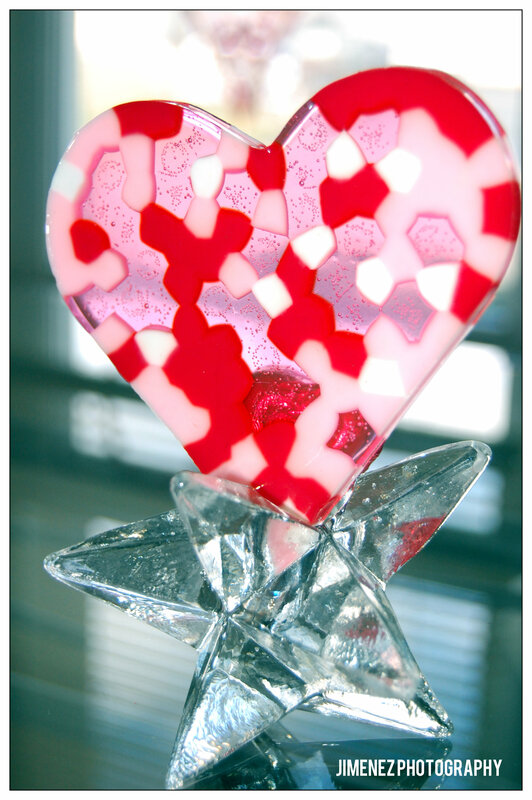 I made sure that I filled up the hearts with enough beads to fill the cookie cutter from edge to edge. Then, being a little nervous at trying this, I placed them in the oven at 425 degrees, and watched them closely. When the beads were completely melted and the tops were completely flat, it was time to remove them. I set them out to cool completely. Now, came the time to see if I could actually remove them from the cookie cutters. Man, I was nervous, but all worked out in my favor and they popped right out! Yeah! I will now get the drill out and drill a small hole near the top of each heart and hang them in our window for Valentine’s Day. 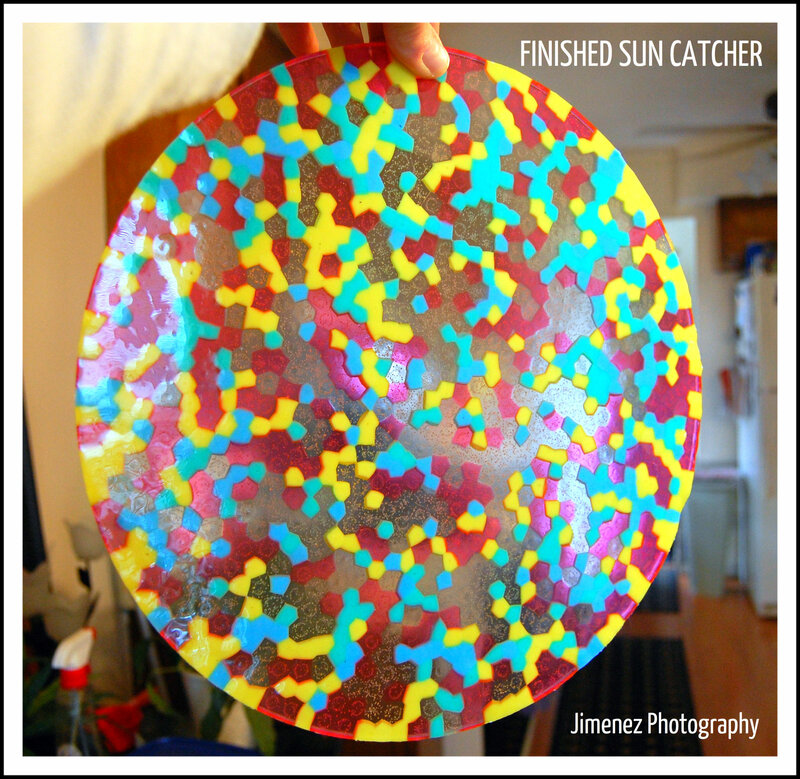 Now, I wish I had a huge heart shaped cake pan to make a large heart sun catcher! A girl can dream, eh? 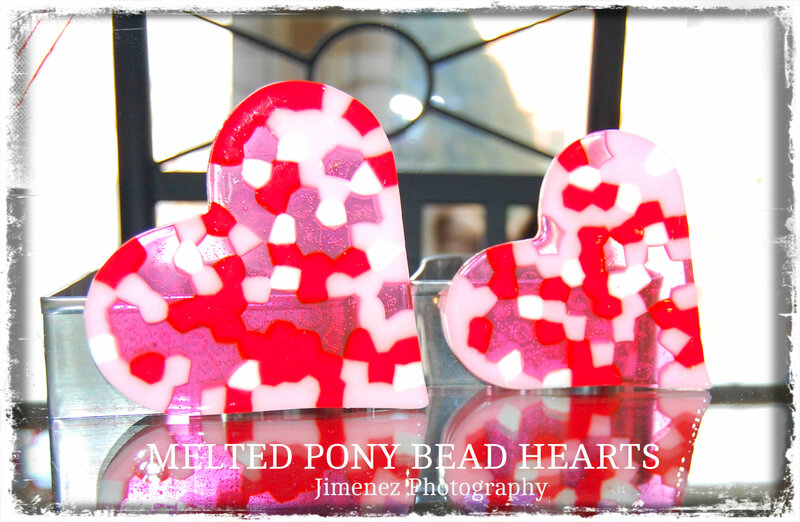 So what do you think of these heart shaped melted pony beads? Are you going to try to make some for yourself? If you do, I want to see them! Everyone loves a good craft idea, and today seemed like a good day to craft up a good one so I pulled out my vast supply of different colored pony beads and got to work! 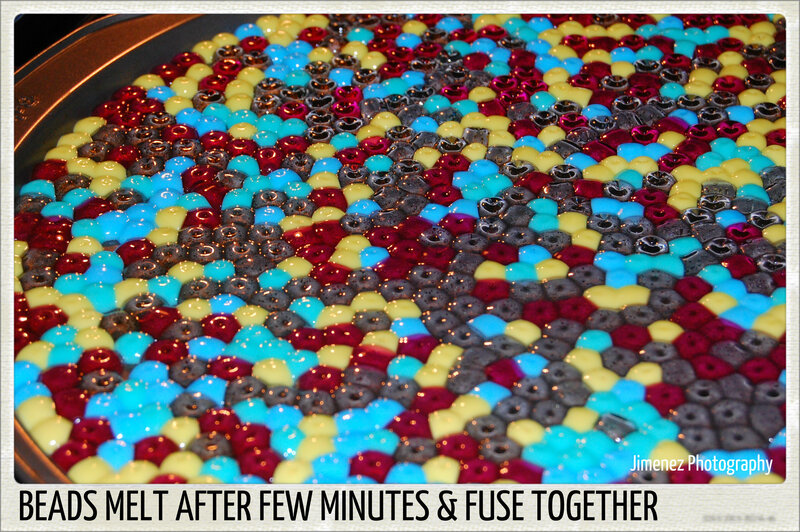 I grabbed my older pizza pan and started pouring different colored pony beads into the pan. I made sure that I added lots of clear ones to give a nice see through look once it is completed. I made sure that I poured enough pony beads onto the pizza pan to cover the entire pan and the beads were close and touching each other. 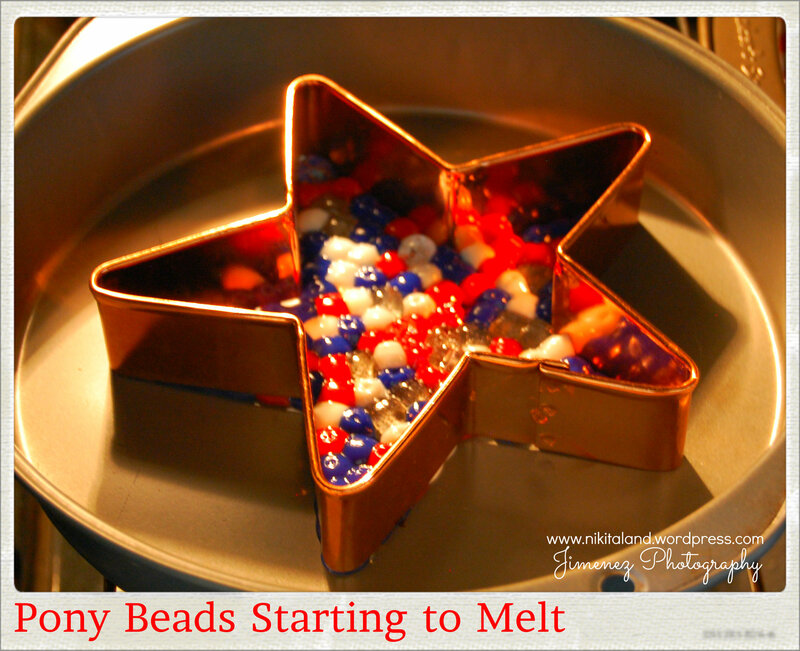 Once I had enough beads in the pan, it was time to melt them! Set your oven to 425 degrees and get it nice and hot. Once your oven has heated up nicely, carefully place your pizza pan in the oven. Now the waiting begins. Since I have already done this type of craft project last year, I used our gas grill to cut down on any of the stinky smell from the beads melting, but today, I just opened up the windows and turned on the ceiling fan to rid any odor. Just so you know, the melting beads did not create much smell in the house, but since we are having a nice warm day for a change, having the windows open for fresh air was nice. Watch your beads now closely. 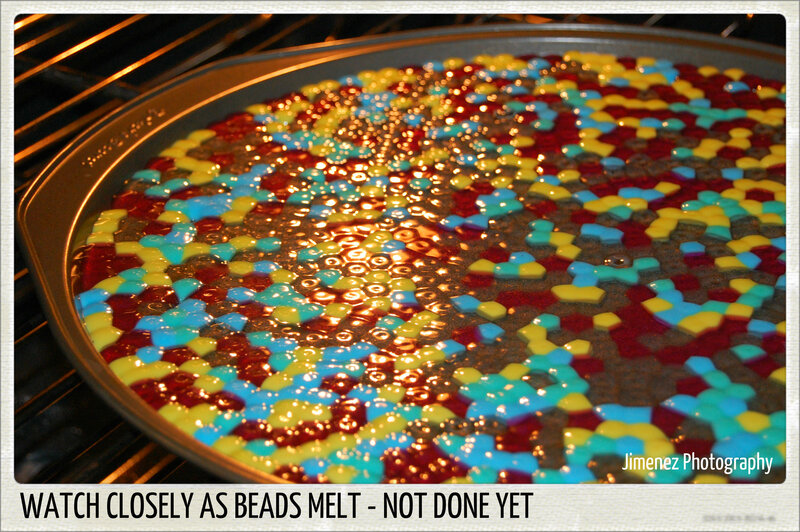 You will see the beads starting to melt after a few minutes in the oven, as they will get glossy looking. Keep watching them as they melt into each other and form a nice flat edge around the pan. You will know when they are done & ready to remove from the oven when you cannot see any “bumps” or “hills” on the top of the melted beads. If you see little bumps, they need a few more minutes in the oven. After a few minutes of cooling, carefully touch the pizza pan to see if it has completely cooled. If it is still warm to the touch, let it sit longer to cool completely. Do not remove your item from the pan until it has completely cool or it could lose its shape. Once completely cooled, you can now turn the pizza pan upside down and your melted beads will now pop right out of the pan! I made this item today so I can get ready for Spring! I will turn this into a sun catcher and add some wind chimes to the bottom. What a beautiful piece it will be when the sun shines through it. This item that I made can be drilled too! I will use a drill for a hole at the top, and for the small holes to hang the wind chimes on too! Also, while I was looking at the finished product on my table, I also thought that this would make a neat cupcake platter too! 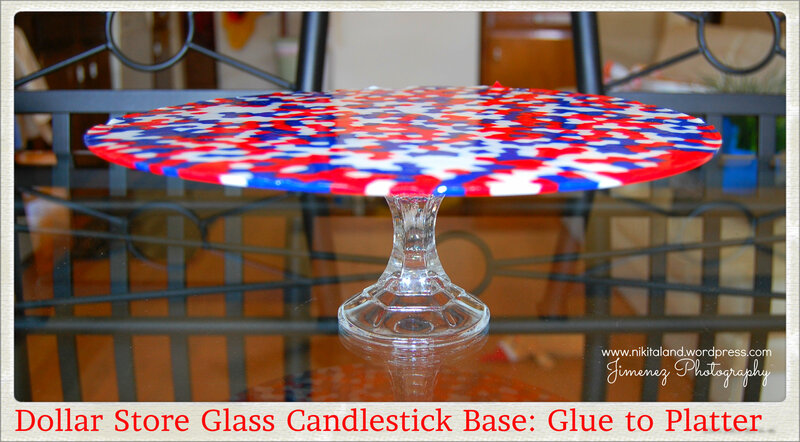 I would probably want a little stand on it, so I could head on over to the Dollar Store and purchase a glass short candle holder for $1 and glue it to the underneath center of the melted beads platter. 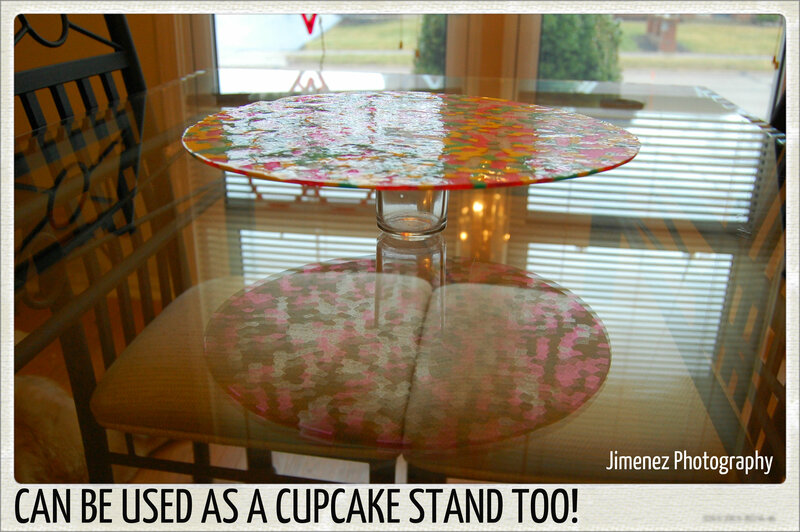 Whala, instant cupcake stand! If you have any pony beads just laying around – I encourage you to pull them out the get crafty! I will never think of my pizza pan the same again, as I found out that it is just not for pizza any more! I can’t believe yet another year passed us by, as 2012 came to an end and we’re ready to start a brand new year….and some new craft projects too! I thought it would be fun to share with you some of the craft projects that I made last year, and I definitely look forward to a new year of inspiration and creativity as I delve into some new areas. 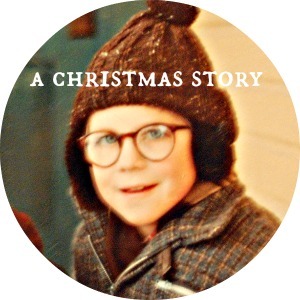 I am sure that I have overlooked a lot of crafts for this post, but not because I did not like the outcome of them, rather the amount of them, and it was hard to choose which ones to show. CEMENT HAND BUSINESS CARD HOLDER: This was made with a latex glove filled with cement, and positioned just right, and while it was drying I pressed a small piece of wood in the palm of the hand to make the indent for the business cards. PAINTED COASTERS FOR HALLOWEEN: Simple project, purchased some cork coasters at our local store and spray painted them orange, then cut out some faces in card stock paper and painted the black faces on, then sealed the coaster with a nice coat of sealer. WOOD LOVE PLAQUE: I made this item to sell on our eBay store and had great success! It took quite a long time to cut this design out of wood, with all the curves it had, but it was well worth the time and effort. To make the design of this plaque, I opened up Publishes and made four blank pages, then I played around with some fonts to see which one I liked best, then enlarged the font to a letter sized piece of paper, and printed it on card stock. I then cut out each letter, and taped them together as the photo shows and used this as my template. CEMENT SKULL: This was made from a cement skull mold and I mixed up some Quikrete, added a hook for hanging, and let it dry. CEMENT TEALIGHT HOLDERS: Made from household containers, like a cologne box, or a plastic lid. Very easy project to do! CEMENT “GROW” STEPPING STONE: We purchased a neat cement mold from a seller on eBay and I made a few of these grow stepping stones. The mold was amazing on how much detail it showed after it dried. I love this! OOPS, A DUPLICATE – CEMENT TEALIGHT HOLDERS! WOOD LETTER “A” MONOGRAM: I made this for Roy’s sister for Christmas! PATRIOTIC WOOD BOXES: How I made these were actually from an idea I saw on someone’s blog, but they were making clay houses for their catus. I liked the idea and made a bigger version and designed mine out of wood. I have used these little wood houses all over the house and even used them on Fourth of July for silverware holders too! WOOD BAT: I love all the wood bats that I have made! I even hot glued some lights to the back of one and now it glows when I hang it on the wall! Neat idea, eh? PAPER MACHE SNOWMAN: This is one of my favorite craft projects! HALLOWEEN CEMETERY COLUMNS MADE FROM BOXES: These columns are a big hit on Pinterest! I made them from some leftover boxes (all of the same size) and taped them together with masking tape, then spray painted them to look like cement block. Everyone loved this idea! PATRIOTIC MONOGRAM FOR FRONT DOOR: I hand drew a large “R” for my boyfriend and painted it in patriotic colors. Got a lot of compliments on this! WOOD LETTER “N” LEASH HOOK: I made this for our dog Nikita to hold all of her leashes. I hot glued strong magnets to the back of it and it is now on our backdoor! PAPER MACHE PUMPKIN: This is the first (of many) paper mache pumpkins that I will be making. The process takes a long time, since you have to wait for each layer of paper mache to dry before adding the next layer, but we will be using lots of these pumpkins as props in our yard next Halloween. We will also be selling them on eBay too once we get a few of them completed. WOOD “GROW” SIGN FOR OUR GARDEN: Enough said about this garden sign – – you just want your garden to well, um….Grow! BENDABLE MUMMY GUY: Just a little bendable mummy to sit on your shelf, or anywhere you wish him to be. Lots of fun to make him and wrap him up in gauze! 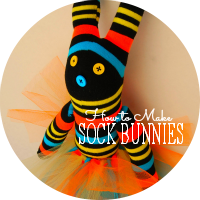 SOCK BUNNY TUTORIAL: Now, these little bunnies will make a huge hit as a gift, for your pet, or placed in an Easter basket or Christmas stocking. No matter how you use them, the recipient will be happy! So, with 2012 behind us now, I am looking forward to a new year and some new craft projects! One idea that I am anxiously waiting to start, is making adorable pillows that will brighten any room, and also figuring out how to make little pillows with photographs on them. I know that Mod Podge has a medium photo transfer paste to do just that, and I can’t wait to try it out. I want to try my hand at making little “Animal Pillows” with Nikita and Bella on them. You could place these on a chair, couch, or the bed for an adorable accent! Obviously, this will make a great blog post tutorial when I figure it out! I can’t wait. 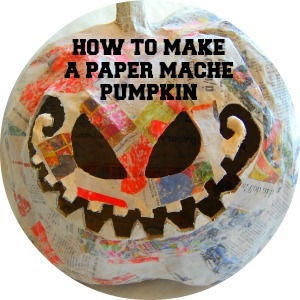 In 2013, I also want to delve heavily into making paper mache pumpkins in all shapes and sizes! Once I get a few completed, we will list them for sale on our eBay store. What? You did not know that we have an eBay store? Shame on you! You can view our eBay store by clicking on any of the buttons on the side of this blog! As an eBay seller, we sell mostly seasonal items, and since we love Halloween, we thought that the paper mache pumpkins would be a huge hit.